Big excitement! 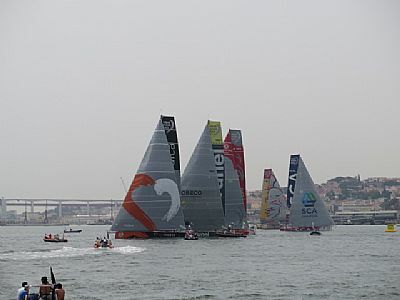 We were off to Lisbon for a few days cumulating with the weekend In-Port Race and Leaving leg of the Volvo Ocean Race in Lisbon. Our first visit to the Race Village was on Thursday where we spent the afternoon watching the first Pro-Am race. We couldn't quite see what the course was from where we were standing but it was thrilling anyway. Saturday we were only able to get to the Race Village in time for the end of the In-Port race. Our time schedule allowed us to watch the return to the pontoon and the award ceremony. Sunday was D-Day! We were extremely fortunate to have had a place on the Rebonave Tugboat (organised by the daughter of our friends). Watching the race from the water was amazing. Like kids in a sweetie shop we didn't know where to look first. Fortunately the yachts were quite closely packed giving us some good picture opportunities. Tired but happy.